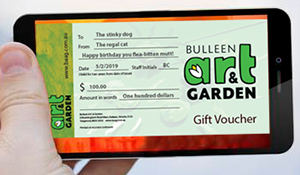 We will email your Gift Voucher free to anywhere in Australia by 5pm on the business day after the order is received (or sooner). The voucher will be a pdf. A printout of the voucher or a copy on a mobile device will be required to redeem the voucher at BAAG. You can choose for the voucher to be sent to either your email address or directly to the recipient. Once you press ‘Submit Form’ you will be taken to a page where you can safely enter your credit card details on a secure NAB site. We will only use your phone number if there is an error in the email address. The ‘To’, ‘From’ and ‘Message’ fields will appear on the voucher.